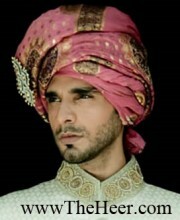 Smart appearance banarasi jamawar turban in pink color. Beautiful decorative accents front. Pre tied. Long tail.Made in Pakistan. Click the button below to add the TB410 Pink Banarasi Jamawar Turban to your wish list.